Today is a very exciting day for Real Truth Matters and for me personally as we just launched the new RealTruth Matters Magazine. One of my long-time dreams of designing my own magazine has been fulfilled and my heart feels like it could explode in tiny little particles of joy and gratitude. I am so excited for this magazine and the opportunity to take God’s Word to the nations in a completely different avenue than I ever imagined. God is so good and may He receive all the glory! For the past several months, the Real Truth Matters team has been working on a brand new interactive web magazine that launched yesterday. RTM Magazine has a little something for everyone: a Christian living section, a pastors section, a missions section, and much more. This magazine is designed to equip, encourage, challenge and motivate Christ-followers around the world to a greater pursuit of Jesus Christ, who is the Gospel. 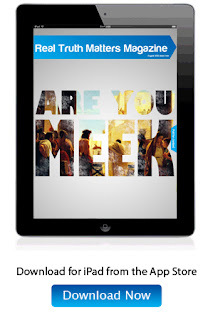 As you open the first issue of the magazine you will journey on the mission field of Eastern Kentucky and Eastern Europe, read about God’s commitment to you, and discover the real definition of meekness. You will also meet a family with a heart for displaced children and a couple driven away from God and right into His arms. Below is the promotional video for the magazine. Please watch and then share it on your Facebook and Twitter as a way to inform others of this exciting new publication. Real Truth Matters Magazine from Real Truth Matters on Vimeo. We are eager to share this new resource with you and hear your feedback. However, we need more than feedback, we need your help. We are asking you to send us 10 names and email addresses of people who would benefit from this exciting new magazine. In addition to the email addresses, we ask that you join us in prayer asking God to use this publication to spread His fame and glory among the masses. Thank you for helping us spread the word about this new resource and the Gospel of Christ! Together we can join God in wrapping His arms around the nations. To access the magazine made ideally for the iPad, but also available for viewing online, visit: www.realtruthmatters.com/magazine. Next Post Next post: Monday Morning Munch No. 7 – Why do bad things happen?